The times we live in exacerbate the urge to escape from all the stresses and strains that make the real world a place where things indeed often don't work out. When you consider the suggestions in the weekly New York Times "Escapes" section, a ticket to Broadway's newest and most old-fashioned yet original feel-good musical, The Drowsy Chaperone is a getting away from reality option sure to give you the biggest, most enjoyable bang for your buck. Once you take your seat and the house lights dim, the show's irresistibly lovable tour guide known as Man in the Chair and played with zip and zest by co-book writer Bob Martin, will take you on an armchair ride back to the colorful Jazz Age via one of his favorite chasing the blues away records of a fictional feel good confection named (what else?) The Drowsy Chaperone. The Marquis stage has been transformed into Man's cluttered and somewhat shabby apartment, his armchair and an old-fashioned record player (you know, the kind with a needle that sometimes gets stuck in the vinyl tracks) tucked into a downstage corner. This being a magic carpet ride, count on designer David Gallo to support Martin and co-writer Don McKellar's conceit with plenty of his own magic: A refrigerator becomes the doorway for the gorgeously dressed, deliriously silly characters to enter Man's apartment and for appropriate set pieces to emerge from walls and drop from the ceiling (including an airplane for the finale). There's even an elevator-like contraption for the entrances and exits of oomph-laden show girl, Janet Van De Graff (Sutton Foster) whose marriage and retirement her Ziegfeldish producer (Lenny Wolpe) tries to circumvent with the expected mistaken identities to delay the foreordained happy ending for all concerned. While director/choreographer Casey Nicholaw and the superb cast cleverly evoke characters and devices from a cornucopia of stock musical characters The Drowsy Chaperone is more than another send-up for theater buffs to play name the allusion and for even those who don't get it all to enjoy. The narrator's running commentary is better than any course or book on musical theater. It get right at the heart of the genre's special magic and its hold on our imagination. The show's own history is quite magical. It started as a small let's put on a show sketch comedy in 1998 and last year moved on to a more starry and elegant Los Angeles production without losing its charm. The buzz stirred up by that production immediately set the wheels in motion for its transfer to Broadway. There have been some changes -- a new number and an extended sequence for Sutton Foster -- who is not only terrific as the glamorous would-be bride, but is an amazing trooper who, after breaking her wrist, soldiered on and still does several somersaults using just one hand. These relatively minor changes excepted, Laura Hitchcock's review of the Ahmanson production applies to the Broadway Chaperone and so, rather than repeat what she already said so well, herewith a somewhat condensed version of Laura's comments followed by the current production notes and song list. The show is like your favorite person whose emotions and desires bubble up like bootleg champagne, who wears flamboyant clothes, loves attention, is indescribably silly and fun to be with, and makes you forget the sleet is falling. Man in Chair (Bob Martin) who opens the show commenting from his shabby flat on his love of 1920s musicals that transport him to a colorful other dimension. The action freezes as he says "This scene is ridiculous!" or "I hate this scene!" Sometimes he joins in a dance and tells you things you'd rather not know about what happened to the actors who play these characters, adding yet a third dimension to this one-dimensional world. He's a fan from pre-CD days with his collection of "records." When Act II starts out in a gilt-and-scarlet Chinese temple he cries "It's the wrong show" and the actors in their mandarin costumes slink disconsolately off stage to get ready for 1928 again. We're disconsolate too, since the score started off so promisingly with "What is it about the Asians that fascinates Caucasians?" Man in Chair is the heart of the show. He stands in for the audience and drolly personifies the guilty pleasure we take in escaping to the roles of gorgeous greedy prancing dancing people we'd love to be -- but just sometimes. 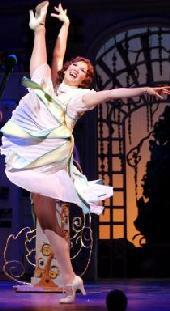 If only we could dance like Sutton Foster who plays Broadway star Janet. She sings in a sweet spicy vibrato and does a dazzling dance that ends in a split while changing from one gorgeous costume into another, saving the most breath-taking best for the encore. Foster wears each 1920s confection as if it were her birthday suit. In "Show Off," she almost convinces us that she doesn't want any more attention from the hovering press -- that is, until best man George (Eddie Korbich) persuades groom Robert (Troy Britton Johnson) to go roller-skating blindfolded and he encounters Janet who decides to test him by pretending to be Mimi. Of course, he flunks. That's the plot which serves as catnip to her producer Feldzieg (Lenny Wolpe), who is being stalked by two gangsters (Jason and Garth Kravits, clones of the "Brush Up Your Shakespeare" duo from Kiss Me, Kate), to insure Janet stays in the show. The Drowsy Chaperone steals shamelessly and joyfully from everybody but it isn't a parody. It's a homage, with all the stock characters created in 1920s musicals who found their way into early movies. Georgia Engel is delicately ditzy as Mrs. Tottendale. Think Spring Byington playing Altzheimer's with charm. There's also Feldzieg's arm candy Kitty (Jennifer Smith) with her Miss Adelaide voice and her dumb-like-a-fox marriage trap and Adolpho (Danny Burstein), the Latin lover no show can do without. Of course, there's the always tipsy Drowsy Chaperone herself (Beth Leavel), an elegant question mark in costumes to die for. Kecia Lewis-Evans, of the rich voice and dazzling smile, plays an aviatrix named Trix (what else?) who descends in her airplane, another homage (let's believe it's to George Bernard Shaw's Misalliance not Miss Saigon despite a repairman who raves about that show). With the descent of Trix and her plane, Man in Chair finally gets his wish as he joins the cast. Editor's Note: Check out the show's very handsome and informative website is up -- http://www.drowsychaperone.com/ -- and loaded with pictures, cast bios, video clips. And with the Chaperone already nabbing an unprecedented fourteen Drama Desk nominations, don't be surprised if it dances off with the a fistful of Tonys. For sure, if you had the blues when you walked in, you'll be smiling as you walk out. Book by Bob Martin and Don McKellar, by special arrangement with Paul Mack. Cast: Danny Burstein (Adolpho), Sutton Foster (Janet Van De Graaff), Georgia Engel (Mrs. Tottendale), Edward Hibbert (Underling), Troy Britton Johnson (Robert Martin), Bob Martin (Man in Chair), Eddie Korbich (George), Lenny Wolpe (Feldzieg), Jennifer Smith (Kitty), Jason Kravits (Gangster No. 1), Garth Kravits (Gangster No. 2), Beth Leavel (the Drowsy Chaperone) and Kecia Lewis-Evans (Trix). Presented by Kevin McCollum, Roy Miller, Boyett Ostar Productions, Stephanie McClelland, Barbara Freitag and Jill Furman at the Marquis Theater, 1535 Broadway, at 45th Street, (212) 307-4100. Monday to Saturday at 8:00 p.m. with matinees on Wednesday and Saturday at 2:00 p.m -- and a Sunday 3pm matinee after May 3rd. Closing 12/30/07 after 674 performances and 32 previews. 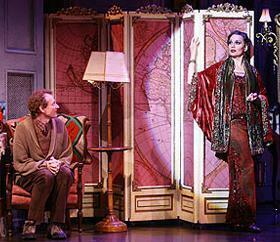 The Drowsy Chaperone has only taken a year to travel across the Atlantic to London. It has come with its original director/choreographer Casey Nicholaw and the man, who for me, is the star of the show, Bob Martin known only as the Man in Chair, in his oversized cardigan. On opening night in London's Novello Theatre, it felt like New York because there were so many Americans in the audience. They were probably connected with the show and many knew the jokes that were coming because they were laughing before the punch line. But this sounds mean, for the jokes are delicious right from the original opening when we hear the voice over telling us, "I hate theatre. It's so disappointing isn't it." The idea of this gay man who loves old fashioned musicals imagining one coming to life in his studio flat is novel and intriguing. It is his asides which are so very witty. I loved too the way he affectionately hangs around and gazes up at the leading man, all cow eyes and fluttering eyelashes. Of course the old fashioned musical within the play doesn't make a lot of sense in terms of plot and sadly Elaine Paige as the eponymous Chaperone has very little to do apart from slurping cocktails. She really isn't tall enough to display the superb costumes. She is almost half the height of the talented and very leggy Summer Strallen who stars as Janet Van De Graaff. Strallen sails through her song and dance numbers. In "Show Off" she does just that with leggy splits. John Patridge as Janet's fiancé Robert Martin and Sean Kingsley as George are fabulous tap dancers and the scene where they compete with tapping feet until the soles of their shoes produce smoke shows panache. The audience loved the comic lead in the musical, Adolpho (Joseph Alessi), sporting his bizarre hair style with its white ice cream cone streak as the ex silent film star who has never learnt to act in any way other than the overstated. The staging is very clever, fitting in as it does around the Man.s sofa and fridge and for its closing number there's the delightfully tacky and over the top aircraft on stage piloted by Trix (Enyoman Gbesemete). Even the needle getting stuck in the groove of the old 78rpm is a clever moment as the whole cast get stuck in a five second loop. This is a show for people who love old musicals with lots of insider jokes but the question is whether it will get show legs in London.